A Virginia man is in outrage after his feelings were “hurt” after water bottles and racial slurs were thrown at him over the weekend on July 12, 2015 during his Confederate flag parade that ended in a bit of violence. The 100-strong makeshift pride procession snaked its way through Southside Virginia from Chester to Petersburg, a town with a black population of over 77 percent, according to 2013 census data. What was waiting for the group as they drive through town was not a collection of southern heritage supporters. As the Confederate convoy was making its way through Petersburg, an eyewitness video posted to YouTube shows someone in the crowd throwing a bottle of water at Chris Oliver’s pickup truck. Oliver, the victim in the incident, called police after he said his feelings were hurt from the townspeople disrespecting his parade. ‘“My initial reaction was, ‘What the hell?’” Oliver said. He explained could not understand why he had not been welcomed with open arms into the predominately black community while parading with his army of Confederate flag lovers. “There was people protesting, throwing bottles, hit my truck, hit numerous other vehicles, people yelling, yelling racial slurs,” he told reporters. The Olivers filed a report with the Petersburg Police yesterday. Esther Hyatt with the police department told reporters the incident is currently being investigated. Videos of the bottles being thrown and racial slurs being shouted at Oliver went viral on the Internet over the weekend, gathering over two million views. Though, the victim claims authorities told him they have not obtained enough evidence to make any arrests. “The racial slurs are really what hurt me,” Oliver remarked. “You know, it’s uncalled for. There’s no need for that in today’s society.” Contrary to his belief, the Confederate flag demonstration in the predominately black town was not welcome in the slightest. Confederate flag demonstrations are not being shut down in the greater Richmond area as the flag’s symbolism runs rampant through national news. Just under a dozen flag wavers still stand at the Virginia Museum of Fine Arts just off North Boulevard in the Museum District. 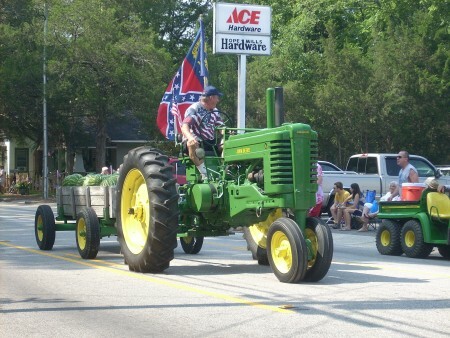 Jerry Dyson of Colonial Heights, Virginia, told sources there are more flag runs being organized in the area. “We’re still here. It’s not going to go away,” he said. This time Dyson said the demonstrators plan to raise money to send to the families of the Emanuel Nine. Just a few days after the Charleston massacre, Richmond also witnessed the vandalization of the Jefferson Davis (President of the Confederate States of America) statue on Monument Avenue. It was reported that a young man was taken into custody for spray painting “BLACK LIVES MATTER” on the base of the monument. The Olivers insisted participating in the flag run through Petersburg is their right, and residents of the town should have respected that. Nonetheless, the Confederate flag parade that made its way through the mostly black southern town have people talking more about the flag’s relevance in modern society. Last week, South Carolina Governor Nikki Haley signed legislation that banned the Confederate flag from all state grounds, including the flag that once sat on the front lawn of the State House. 3 Responses to "Confederate Flag Parade in Virginia Ends in Violence [Video]"
I would like to thnkx for the efforts you have put in writing this web site. I am hoping the same high-grade website post from you in the upcoming as well. Actually your creative writing abilities has inspired me to get my own site now. Actually the blogging is spreading its wings quickly. Your write up is a good example of it. The story is bull. The flag parade did NOT “end in violence”, the flag carriers were not ‘attacked by a mob’ or anything close to it. I live here; there is huge support for the Confederate flag. Most black people in the Richmond area don’t give a hoot one way or the other. The only persons who take to protesting are (a.) black ne’er do wells who are angry with life in general and (b.) white college students who come here from outside the area.